MY DAUGHTER SAID SHE WANTS TO BE A MOMMY WHEN SHE GROWS UP. - ProudMummy.com the Web's Community for Mums. Home » Memes » Parenting » MY DAUGHTER SAID SHE WANTS TO BE A MOMMY WHEN SHE GROWS UP. MY DAUGHTER SAID SHE WANTS TO BE A MOMMY WHEN SHE GROWS UP. MY DAUGHTER SAID SHE WANTS TO BE A MOMMY WHEN SHE GROWS UP. 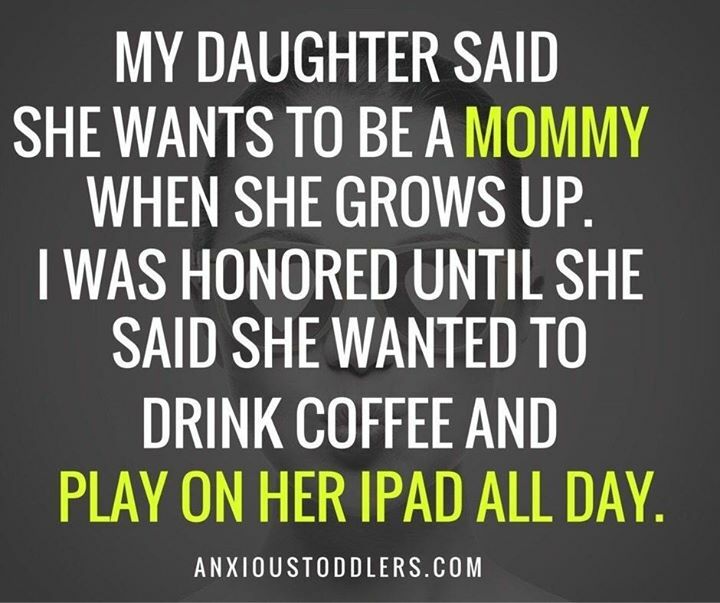 I WAS HONORED UNTIL SHE SAID SHE WANTED TO DRINK COFFEE AND PLAY ON HER IPAD ALL DAY.